So you’re an aspiring game writer, now what are you going to do about it? You could get a job as a summer intern at a local game company and work for free doing all sorts of tedious tasks no one else wants to do. Or you could hit eBay and do yourself a huge favor and find this text. Before you write back about the publication date, yes it was published in 1995. No, it does not talk about OpenGL or DirectX. Phew, now that we have that out of the way, let’s talk about what this book can teach you. This book’s greatest strength is how it dabbles in a number of good topics without being totally useless. A number of texts provide a lot of information about too many topics, while not providing enough material to do something fun or useful. That exercise is often left to the reader. Ha! A book like that in my house will pay a little visit to the recycling bin or get banished to the library, never to be read again. Other books tend to steam roll over you with too much theory of the mathematical kind. 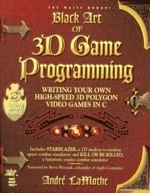 While I’m all for roots and quadratics, aspiring young programmers wanting the enter the field of game development shouldn’t necessarily want to go whole hog on their first book. That being said, they will need some basic skills to get started, and matrix math is a fundamental skill for playing around in 3D. Fortunately for the junior programmer, it’s not the most difficult skill to learn. One of the black arts the book teaches you is how to master 2D and 3D transformations using matrix algebra. It doesn’t go into quaternions for gimble-lock free rotations, but since the reader is probably just starting out, it doesn’t really matter either. They will be able to make do without all of the fancy topics getting in the way of actually learning something useful. The book does show its age in some chapters where the topic of conversation is how to take control of various video modes, but I think it’s still a worth while read. You can still do this kind of programming if your recreational operating system of choice is FreeDOS or some other version of DOS, even on a modern PC. You could even use Windows 95 or 98 for that matter, just get it to boot using the version of DOS which ships with all of that GUI crap. Trust me, you’ll be better off in the long run, plus you can wow your friends with your amazing latch register skillz.